With the rise of novel psychoactive substances, diverted ADHD medication abuse, and new highly caffeinated products, adolescents and young adults are consuming psychoactive substances in unprecedented levels. Some individuals consume these substances alone, but frequently, abuse of psychostimulants occurs simultaneously with alcohol consumption. Adolescents and young adults consume these substances together in order to potentially increase the rewarding effects of the drug combination or decrease the sedative effects of alcohol alone. Yet, the long-term effects of exposure to psychostimulants with or without alcohol in adolescence are widely unknown. Our research investigates these effects by monitoring changes in drug reward, drug sensitivity, and neurochemical adaptations that occur upon repeated adolescent exposure. We utilize behavioral assays to monitor drug reward and cross-sensitivity to other drugs of abuse, such as cocaine, as well as in vitro assays to understand the cellular mechanisms responsible for our observed behavioral changes. Overall, our research suggests that exposure to psychostimulants in adolescence increases behavioral and chemical markers associated with increased future drug abuse. Our studies additionally investigate potential male and female differences in sensitivity. The last decade observed a steady increase in the consumption of energy drinks in the US. During the same period, an increase in energy drink options arrived, in particular those with caffeine concentrations two or three times as strong as more traditional energy drinks such as Red Bull® and Monster®. The potential risks of rapidly consuming (or binging) on alcohol-mixed energy drinks on the developing brain have not been studied well, in part due to ethical concerns with setting up such a study in minors. While not as prevalent as alcohol dependence, heavy caffeine consumption in certain individuals may lead to withdrawal symptoms (one sign of dependence). Additionally, caffeine and alcohol are known to release dopamine in the mesolimbic system. We are investigating how adolescent exposure to energy drinks and alcohol-mixed energy drinks affect the abuse potential of drugs such as alcohol and cocaine in adulthood, as well as how these drinks affect cognitive functions such as learning flexibility. Interestingly dopamine receptors and adenosine receptors, the targets of caffeine and alcohol, have been found to form heteromers (D1-A1, D2-A2A). One of our aims is to investigate what happens to these heteromers upon co-occupation, as well as what impact alcohol mixed energy drinks have on the expression and function of these heteromers. 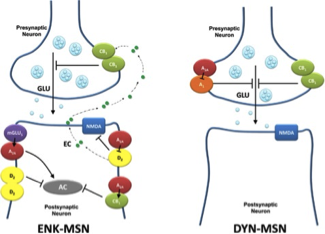 Current techniques involved include in vitro cellular assays to understand receptor signaling and trafficking upon dopamine activation and adenosine antagonism. With an increase in novel psychoactive substances identified yearly, the vast majority of these substances have not been characterized for in vivo or in vitro pharmacological activity. Some of these compounds, such as ethylphenidate (a product formed when methylphenidate [Ritalin] is consumed with alcohol), have been heavily abused due to their legal status and availability through online retailers. Our research investigates the abuse potential of these substances through drug reward, sensitivity, and cross-sensitivity as well as changes in cellular markers implicated in drug addiction.